Some 23 civil society organisations, among which MIO-ECSDE, renew calls for more public policy regulating human health and environmental safety of nanomaterials. The European Commission’s continuing resistance to the development of a clear regulatory framework hampers the safe use and development of nanomaterials. These materials still cannot have their hazard profiles and exposure scenarios characterised, thus their risk assessment is not yet possible. The Commission’s laissez-faire approach applies to all nano-related EU policy areas, from unjustified delays in the revision of REACH Annexes and the definition of nanomaterial, to failure to implement or enforce provisions in the Cosmetics Regulation and the Food Information to Consumers Regulation. Furthermore, the European Commission violates its own internal processes on the identification and impact assessment of transparency measures on nanomaterials by choosing one option in advance of the final assessment by its own Regulatory Scrutiny Board. The precautionary approach enshrined in EU treaties is too often treated as in automatic conflict with EU competitiveness or jobs. This false conflict is created by a European Commission and private industry prioritising industrially biased interests, thereby placing the health of EU citizens and the environment at unnecessary risk. 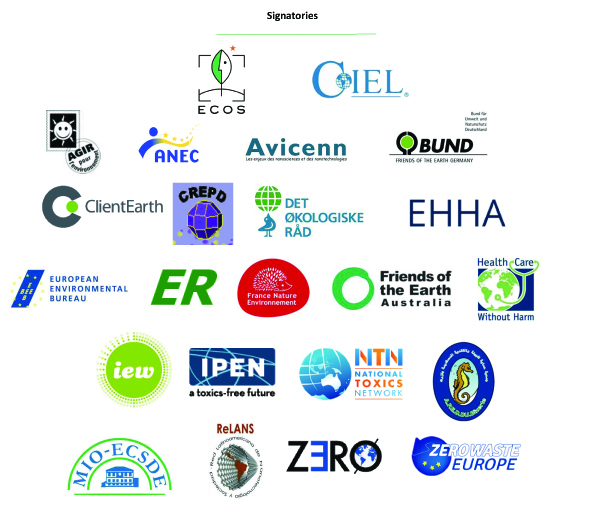 Civil society organisations demand governance of nanomaterials that respects EU objectives of a high level of protection of environmental and human health and consumer safety. Decision-making processes be designed based on effective participatory processes.